India has rich flora and fauna since ancient times. Our country was once known for its dense jungles. And the uncrowned ruler of the jungle world was the tiger. But after the british invasion, the poaching of tigers became rampant in India... The future for tige remains more threatened than ever before. Are we going to save it from the brink of extinction? 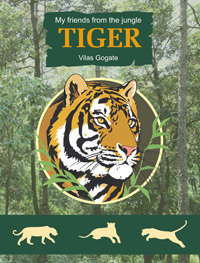 Vilas Gogate, a noted wildlife scientist has spent decades in the jungle studying tigerss and other wild animals. In this book, he lucidly narrates a story of Champa, the majestic tigress. The book also gives information about the tiger species, its origine, conservation of tigers and tiger reserves in India.